Nicknames: "Mike," "Mich," "Met," "Catfish," or "The Cat." Born in Angels Camp, California, on October 8, 1920. Of Croatian descent, his parents were born in Austria. He attended Fremont High School in Los Angeles, California, where he lettered in baseball and basketball two years, and placed on the all-City and all-Southern California teams in both sports two years. His father is deceased. He cannot recall incidents of first play-for-pay game, which was with the Henderson club of the East Texas loop in 1939. He was on the Detroit farm club's roster early in 1940, when the commissioner made him and 90 other Detroit players free agents. He then signed with the Braves and was sent to Evansville in the Three I League. He got the nickname "Catfish" from his Boston teammates, after he stepped on a catfish while trying to pull the hook out of its mouth and a barbed fin went through the crepe sole of his shoe, incapacitating him during Spring training. In 1943, the Braves sold him to the Seals, and the Cat became one of the most celebrated players in the Coast League. 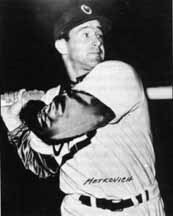 Under Manager Lefty O'Doul, Metkovich moved from the Seals' outfield to first base and raised his batting average to .325. He then went back to the majors to play for the Red Sox for the next three seasons. In 1947 he was sold to Cleveland, and in May of that year came to Oakland along with pitcher Les Webber in a trade that will take Will Hafey to the Indians at the end of the 1948 season. For the Acorns he has belted 23 homers, batted .336 and has 88 RBI's. He owes most in baseball, he claims, to his oldest brother, who practiced with him all the time. His baseball ambition is to stick in the game. Otherwise, to be connected with the aircraft industry. His winter occupation is an airplane inspector. Hobbies are hunting and fishing. Personal preferences: Movies, action; clothes, conservative suits; food, good and nourishing; reading, selected; women, "My wife". The toughest thing in baseball, he avers, is to hit .400 a la Ted Williams. Click on the sounder below to hear a recording of Oaks' commentator Bill Laws describing George Metkovich's experience as manager of the PCL San Diego Padres.